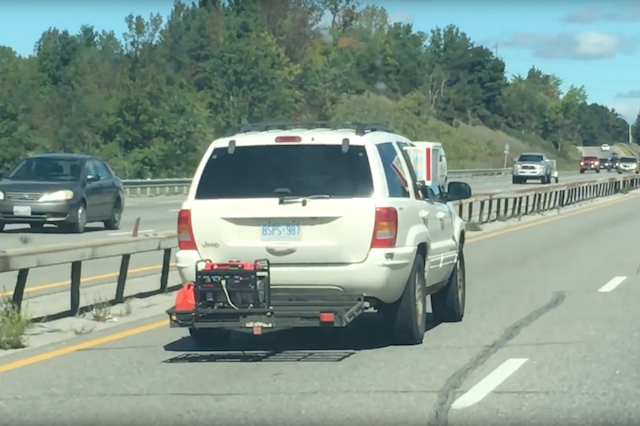 A Jeep with redneck air conditioning has been spotted on an American highway. A dashcam captures the moment a white Grand Cherokee can be seen with an air-con unit hanging out of one of the rear windows. It also has a mobile generator mounted on what looks to be a cycle rack placed on the back of the SUV, presumably powering the questionably placed system. The 4X4 can be seen doing motorway speeds with the improvised unit sticking out of one of the car's windows. At the same time the occupants of the vehicle with the dashcam can be heard discussing and questioning how the air-con runs off the generator, before laughing at the homemade design.